If you had Purdue and Texas Tech in the Elite Eight, congratulations. Purdue knocked off Tennessee and is now one win away from its first Final Four appearance in nearly four decades, while Texas Tech crushed Michigan and is one win away from playing in its first Final Four in program history. Here’s how it happened. First, Purdue beat Tennessee 99-94 in an overtime thriller thanks to monster performances from Carsen Edwards and Ryan Cline, who combined to score 56 points. At first, the Boilermakers looked like they were still hot from their second-round blowout victory over Villanova last week. They led Tennessee by 18 and Admiral Schofield had one point at halftime. Then the Vols chipped their way back—Purdue was awful from the free throw line (16-33 overall), Schofield scored 18 points after the break, and UT started making shots from three-point range and inside. That might have been enough to complete the comeback had it not been for Cline, who finished with a career-high 27 points, 22 of which came in the second half when he went 6-of-7 from three. The game ultimately came down to Edwards, who scored 29 points (on an inconsistent 8-of-22 field goal shooting). He was fouled on a potential game-winning three at the end of regulation and hit two of three free throws to send the game into overtime, where Purdue ended up pulling away. This tournament has been way too dramatic for the Vols. They needed overtime to beat Iowa in the second round after giving up a 25-point lead, then came back from an 18-point deficit only to lose in overtime in the Sweet 16. Now it’s probably time for some to cue up the Can Rick Barnes Win Big Games in March? narrative again. As for Purdue, its three-point-heavy offense faces Virginia and the nation’s stingiest defense in 48 hours. The game will feature star guards in Edwards and UVA’s Kyle Guy and Ty Jerome. Meanwhile on the West Coast, Texas Tech cruised to a 63-44 win over Final Four favorite Michigan. The Red Raiders controlled the game from start to finish and it didn’t help that the Wolverines shot 1 for 19 from three, giving themselves no chance to outscore a defense that’s just as good as their own. Now the Red Raiders play Gonzaga, pitting one of the nation’s top-three defenses against the nation’s No. 1 offense. The game features potential lottery picks in Tech’s Jarrett Culver (22 points against Michigan) and Gonzaga’s Rui Hachimura (17 points vs. FSU). In somewhat similar fashion to its upcoming opponent, Gonzaga handily held off Florida State, 72-58. After last week’s dismantling of Ja Morant and Murray State, the Seminoles appeared indestructible with its length and athleticism. They seemed poised for a deep run. That wasn’t the case against the top-seeded Bulldogs. Four different players for Gonzaga reached double figures, while only Trent Forrest made it that far for FSU. The Seminoles, meanwhile, mirrored the Wolverines' poor three-point shooting, making only three of 20 attempts. 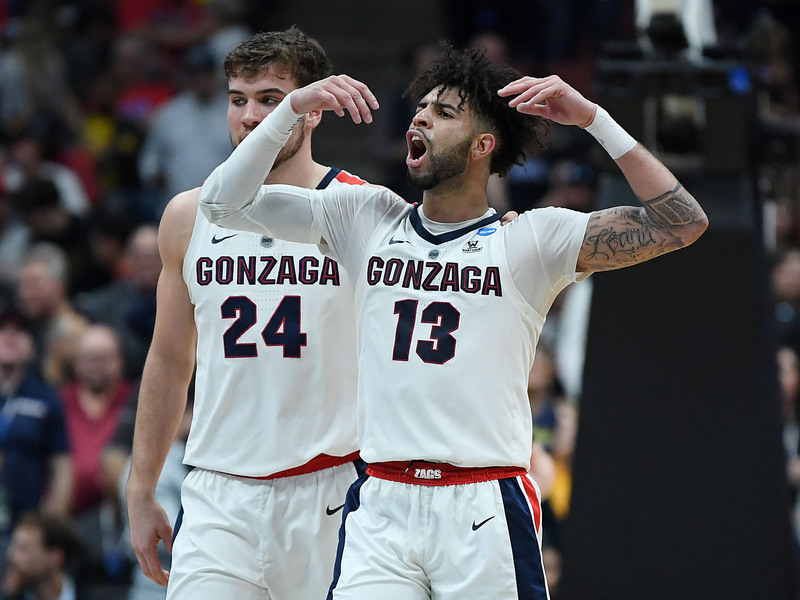 Should Gonzaga’s offense find a way to smother Tech and Culver on Saturday, it will secure its second trip to the Final Four in three years. In the final game of the night, Virginia outlasted Oregon in a defensive battle, 53-49. It was an ugly game and neither team shot better than 38% from the floor. Virginia’s bench didn’t score and Oregon failed to make a field goal over the final 5:43. Now, the Pac-12 is out of the NCAA tournament, while the ACC still has four teams. • Expert picks: Who's heading to the Elite Eight? Our predictions for the entire Sweet 16. While Virginia Tech doesn’t have UCF’s size, the Hokies can still give Duke lots of trouble because of how they play. Their modified Pack Line limits looks around the rim, forces opponents to take lots of threes and they also do a good job taking away transition opportunities. Forcing Duke to be a jump-shooting team in the half court is the best way to slow the Blue Devils down, and that is exactly what VT does with its defensive scheme. SI's Laken Litman makes her picks for Day 2 of the Sweet 16. No. 2 Michigan State over No. 3 LSU: Despite LSU’s size advantage—Tom Izzo said the Tigers have “linebackers on the perimeter”—Michigan State will continue to ride one of the best point guards in the country in Cassius Winston and set up an epic Elite Eight battle with Duke. No. 1 North Carolina over No. 5 Auburn: The faster team in a track meet wins. No. 1 Duke over No. 4 Virginia Tech: Virginia Tech beat Duke by five points last month while Zion Williamson was out with his knee injury. This time, the Blue Devils have Zion. No. 2 Kentucky over No. 3 Houston: Can the Wildcats continue their run without leading scorer, rebounder and shot blocker PJ Washington? Coach John Calipari retweeted a video of Washington, who sprained his left foot in the SEC tournament, walking on Thursday. But his status is still unknown. Purdue will make its first Final Four in the Matt Painter era (he’s been the Boilermakers' head coach since 2005). What somehow gets lost in the shuffle in Purdue’s run this year is the fact that this group lost four senior starters from last year’s Sweet 16 team and had the Big Ten’s ninth-best recruiting class. Painter deserves more credit for building what is, right now, the best and most consistent college basketball program in Indiana and one of the most underrated in the Big Ten. 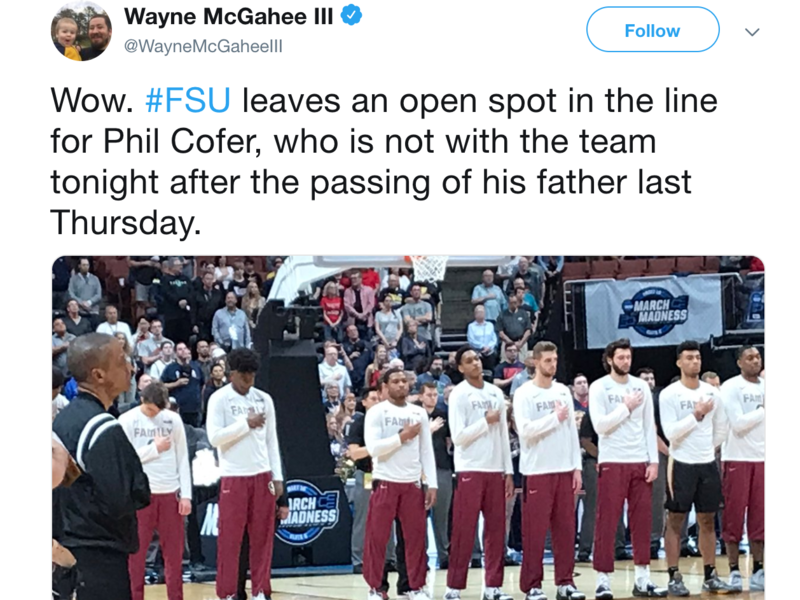 Last week, immediately following Florida State’s first-round win over Vermont, senior forward Phil Cofer received the worst call he could possibly imagine from his mom. His father had passed away. Cofer stayed with his team through the first two rounds in Hartford, but was not with the Seminoles in Anaheim for the Sweet 16, choosing to stay home with his family in Georgia. His teammates paid respect to him during Thursday’s national anthem. On a lighter note, former Purdue coach Gene Keady got a little nervous during the Purdue-Tennessee game.